The Mystic 8 Ball is the novelty toy that lets anyone seek advice about their future! All you have to do is simply â?oask the ballâ?? any yes or no question, then wait for your answer to be revealed. Answers range from positive, to negative, to neutral. 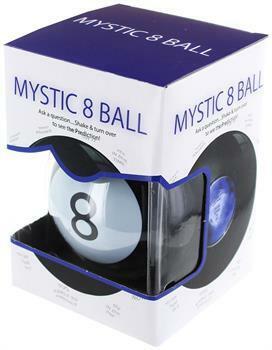 The Mystic 8 Ball is the novelty toy that lets anyone seek advice about their future! All you have to do is simply â?oask the ballâ?? any yes or no question, then wait for your answer to be revealed. Answers range from positive, to negative, to neutral.